The deadline to introduce bills for the first year of the new two-year California legislative session was last week, and more than 2,500 bills have been introduced in both the Assembly and the Senate. A few of them hold specific interest for bicyclists. These include Scott Wiener’s Complete Streets Bill, S.B. 127, which would require Caltrans to implement safety improvements like protected bike lanes and sidewalks every time they repave or rebuild a state-owned road. So far nothing in the bill’s wording has changed since we first wrote about it. Its first hearing, in the Senate Transportation Committee, will take place some time in April. Two other bills sponsored by the California Bicycle Coalition are aimed at cleaning up confusion in the California Vehicle Code about where bicyclists are supposed to position themselves on the road. One, A.B. 697, is the third such attempt from Assemblymember Phil Ting (D-San Francisco), whose earlier tries on this topic ran up against strong resistance from law enforcement. It aims to clean up wording in the California Vehicle Code section 21202, which requires bicycles to be “as far as practicable” to the right of the road. Over time, a bunch of exceptions to the rule have been added. For example, it spells out that a bicyclist may move to the left to avoid hazards–like car doors flung open–or when bikes are traveling as fast as the rest of traffic, passing other bikes, or when a lane is too narrow to share with passing vehicles. 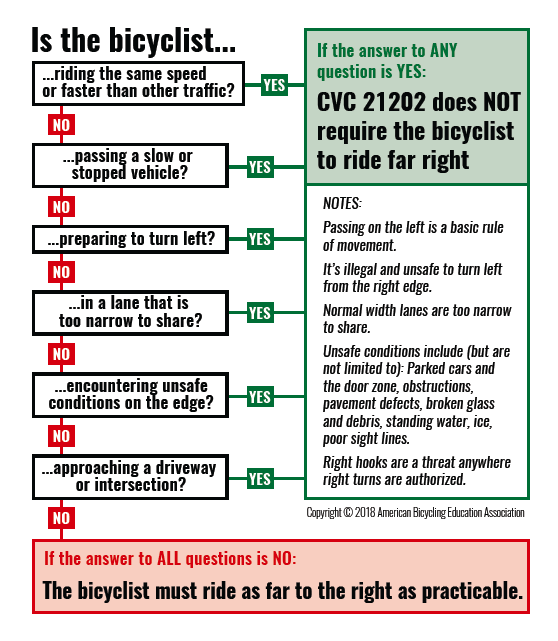 A chart from Cycling Savvy, below, meant to help explain the law, shows how confusing these exceptions make it. Some police departments do get it–notably the Anaheim Police Department, as attested to by this video explainer they just released–but not all do. People are still getting tickets when police officers don’t understand the law, and judges are upholding those tickets. If something takes this much explanation, maybe there’s something wrong with it. Existing law says that you have to ride as far to the right as practicable except under certain circumstances. Those circumstances are listed. One of them is when conditions make it unsafe. Those conditions are listed. One of them is when a lane is of substandard width. That condition is then defined as a lane which is too narrow for a bicycle and a vehicle to travel safely side by side within the lane. In other words, existing law provides an exception to the requirement that you must ride “as far to the right as practicable” that applies most of the time on urban streets, but it buries that exception under three dependent clauses. Every bicycle safety educator with any training teaches people on bikes to take advantage of their legal right to control the right lane until it’s wide enough that you can safely move over to let vehicles pass. Too many people without bicycle safety training don’t know this, including judges and police officers. A judge in southern California even upheld a ticket for taking the lane because according to his reading of the law, you’re allowed to take the lane “practically all the time–and surely the legislature did not intend that.” In other words, he enforced a ticket he admitted was issued illegally because he couldn’t believe the law meant what it said. That’s why we’re changing the wording. Why is it necessary? Because people on bikes are vulnerable to right-hooks–where drivers turn in front of them from the left–when they position themselves too far to the right. Car drivers should slow down and stay behind bikes when approaching intersections, making right turns from the right lane behind any bicycles, but they don’t always do so. Often, occupying the left portion a right turn lane is the correct lane positioning, but unless the design makes it clear that bikes are allowed to do so, under current law it is illegal. The bill is a call for Caltrans to provide design guidance for this situation. There are also a few “spot” bills on the docket, which are likely to be fleshed out before they are heard. Assembly Laura Friedman (D-Glendale) is working on A.B. 1112, which currently says its intent is to “enact legislation to encourage the use of micro-mobility transportation”–that is, scooters. The aim is to create some basic statewide regulations as guidelines for local jurisdictions’ rules on scooters on their streets. CalBike also wants e-bikes to be included as a “mobility option” that people can choose when they participate in the state’s scrap-and-replace programs–so they can trade in a polluting car for an electric bike voucher, if they want. That is S.B. 400 from Senator Tom Umberg (D-Santa Ana). Bills have also been introduced on transit passes, housing, distracted driving, parking, speed limits, CEQA, and other issues. We’re still working through those lists and will update regularly. “Potential negatives” like improved traffic flow, less congestion, fewer deaths and injuries, and more retail spending, as demonstrated by the results of numerous street improvement projects that prioritize humans over automobiles. This is like copy pasta. Has this guy never heard of park & ride? And Streetsblog is about letting people choose travel modes as they wish, with a more appropriate distribution of funding that reflects that we, as a society, value freedom, safety, and quality of life. I guess you didn’t get that memo. It IS about density, since only people who live in the dense center at modest distances to the places they need to go to work & shop OR their transit stops at BOTH the origin and the destination ends of their trips are close to their homes & places they need to go will find walking, biking, or transit to be acceptable ways to commute & shop. And note the distances that are acceptable to walk to and from transit stops and wait for the next transit vehicle go way down in very hot, very cold, rainy, or snowy weather. Ann Arbor puts their shared bikes in storage for the winter – for example. It varies by city of course, but in a very high percentage of cities the high majority of commuters drive and only a modest percentage choose walking, biking or transit. Streetsblog is trying to force changes in the percentages, but they are not practical or acceptable to a very high percentage of commuters. We don’t oppose dense city development, we just know that is not what everyone desires. That’s what they’re doing, but we have people like you making baseless claims to scare them out of it. Cities are free to re-engineer the main collector & arterial streets for lower actual travel speeds, so long as they accept the potential negatives. Well, that’s a choice that they’ll have to make. But that doesn’t entitle them to endanger lives by speeding through communities where people live, work, and play. If they don’t like the slower pace of things, they can look at new routes or a new job. The average 40-50 year old white collar worker coming from 10 miles away will use a bike or e-scooter to commute in their suit and tie with their briefcase? That is most unlikely. Virtual gridlock sure beats literal gridlock. The discontented can use other modes, particularly bikes (or e-scooters). It’s sad that you think that human life is not as critical car capacity. The highways are only so many lanes wide, so explain to my how a wider ramp is critical to commerce? Take a look at “wide” ramps leading to bay bridge. None move traffic any further, but create hazard for other road users. Not necessarily. Some roads are so overbuilt you can easily take out a lane or two and not have much more delay. Do you think 10-15 seconds of delay is acceptable 1-2 hours a day, 5 days a week to improve safety for people when they use bikes? Going from 4/5 lanes to 2/3 usually means far more than 10-15 seconds of delay. Do you believe adding 10-15 seconds of delay to motorists for 1-2 hours during weekdays constitutes “more congestion?” Are you ok with going from LOS B to C if it means safer bicycle facilities 24-7, or would you oppose that as creating more congestion? Lanes on collectors and arterials that are full at rush hours are NOT “extra”, they are critically necessary for commerce. Only because the freeway is already jammed, it’s not getting cars on the highway any faster. Extra lanes just create a car storage “buffer” without increasing throughput of the highway.. Lanes on most such collectors and arterials ARE fully used at rush hours. That’s only if lanes are fully used. Plus safety is our main priority, so you shouldn’t put a price on human life. And thus create virtual gridlock on the main collector or arterial that now has only half the lanes needed for the volume of commuters, shoppers, tourists, visitors, and commercial traffic ?????????????? Good point, that’s why it’s important to make sure that those alternate routes aren’t attractive substitutes. If adding protected bike lanes to a 4/5 lane collector or arterial requires taking two vehicle lanes, then it will almost certainly create more congestion and possible diversion of some drivers to lesser parallel streets that were never designed for high volume traffic.